Doug is a member of Carmody Torrance Sandak & Hennessey’s litigation group. He represents and advises a diverse group of clients in commercial, business, and tort litigation. He frequently represents national and multinational manufacturers, professional corporations, financial institutions, government contractors, medical professionals, and hospitals in high exposure litigation in state and federal courts. Doug also advises his clients as to litigation avoidance practices. In this capacity, Doug engages in thorough preventive counseling by preparing comprehensive risk management guidelines for business operations, and internal audits to ensure compliance with state, federal, and local laws and regulations. Additionally, Doug actively serves the communities he lives and works in. He performs legal services on a pro bono basis for needy individuals and serves in leadership roles for area non-profit organizations. 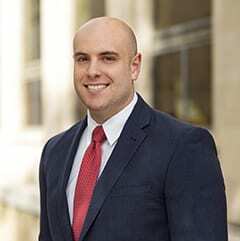 Prior to joining the firm, Doug served as a law clerk to the Honorable Lubbie Harper, Jr. and the Honorable Paul M. Foti of the Connecticut Appellate Court, and as a law clerk to the judges of the Connecticut Superior Court, including the judges of the Complex Litigation Docket.